detracting from the guitar’s aesthetic. 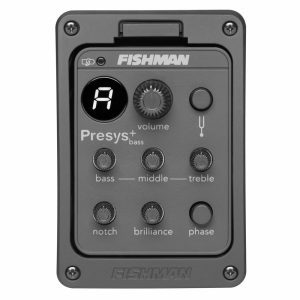 Style, elegance and an intuitive design are the hallmarks of Fishman’s new knob-based Flex Series. Flex models are offered with a range of available features from the basic controls to advanced tuner and blend control models. Fishman’s Flex M Series presents all of the design and ergonomics of the Flex Series but adds a more refined look with faux-tortoise knob inserts and the performance of our flagship Acoustic Matrix® undersaddle pickup. quality in a small, unobtrusive format. offer maximum control, performance and quality in a compact design. performance and quality in a small, unobtrusive format. a comprehensive range of features in a compact design. 3 bands of EQ and a built-in digital chromatic tuner. low-profile, high-impedance design needs no battery. the latest updates to this popular active soundhole pickup. just the right blend at your fingertips. in all of our other premium systems. all in a discreet, non-intrusive design. Blend to give you incredible tone at your fingertips. excellent fit on slim-bodied acoustic-electrics. bridge, and an adjustable ebony replacement bridge. dynamics, and nuances of your bass – only louder.